This fascinating hand colored 1818 map by Edinburgh cartographer John Pinkerton depicts Abyssinia, Sudan and Nubia. Covers from the Great Desert of Selima south to Donga and west through the 'Dominons of a Princes called Ibbe,' Caffa (a Christian State), Bali and the Gulf of Aden. Covers the modern day regions of Ethiopia, Eritrea, Djibouti, and southern Egypt (Nubia). The whole offers beautiful and fascinating notations such as 'The Supposed Ancient Island of Meroe,' inexplicable comments such as 'Here the Portugese found King David Encamped in the year 1520,' caravan routes and desert oases, and religious comments. Also includes details of the politically and socially volatile regions of Darfur (Darfour) and Kordofan in modern day Sudan. 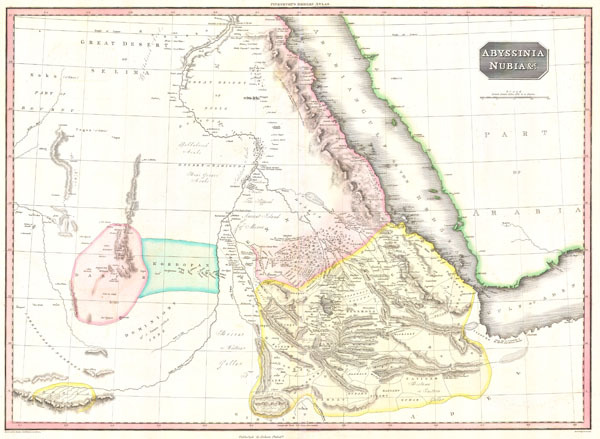 Possibly the finest map of the Abyssinia to appear in the 19th century. The map comes from the scarce American edition of Pinkerton's Modern Atlas, published by Dobson & Co. of Philadelphia in 1818.